John son of Philip (Generation 2) and his children (Generation 3). So we can assume that Philip’s grant was recorded some time after 1810 by one of the officials specified. The date of 1785 would have been entered in government records based on information supplied by Philip or by the collector (i.e. there was no grant issued in 1700s) so the copy Philip had made in 1820 was likely a copy of information collected after 1810. In November 1784 a Philip Noel married Amy Batton at St. Pauls’ Church, Harbour Grace, Nfld. (CSo hurch of England). At that time this was the closest Church of England (C of E) church to ‘the Dock’ (~20 km north ) and many people from other communities in Conception Bay were married there. On the same day that Philip and Amy were married a William Button (Batton) married a Mary Noel at St. Paul’s. The Harbour Grace marriage records currently available on the Internet come from Government files which were transcribed from the original parish records in the 1940s; however, in the original church records there was additional information not in the Government files (source for online versions). This additional information included the names of the brides parents; which for Mary Batten née Noel were James and Anne (using the same data we know that Ann Noel née Batten parent’s were John and Mary). When I was conducting my original research in 1971 one of my sources was Harold Newell (at that time a retired teacher and librarian). Harold, had done extensive research on the Newell and Batten families of ‘The Dock’ and pointed out that this was almost certainly a case of brother and sister marrying another brother and sister. At the time of this wedding the Battens were an established family in Port-de-Grave and Bareneed (communities near ‘The Dock”). If Philip and Mary were siblings then this would mean that Philip’s parents were James and Anne. The fact that Philip named his first son James provides additional support for this conclusion. In addition, William and Mary Batten named their daughter, born at Harbour Grace in 1786, Anne. Recent research on my DNA supports this link between the families. 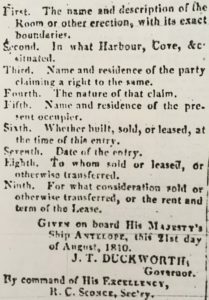 a census of Conception Bay conducted in 1817 list both Philip ‘Nule’ and William Batten as residing in ‘The Dock’. Based on the census of 1817, Philip and Amy had at least four children. See Merchant Connections section of this Site for more information on this census. Based on these records we can reliably estimate that James was born c. 1785 and John c. 1793. This Emma Newell from ‘The Dock’ would have been born c. 1774 which is is too old for a child of Philip or the wife of one of his sons. Assuming that the age at death is correct and not a transcription error then there are two possibilities. Either that she was the wife of a younger brother of Philip, who possibly died before inheriting land, or ,more likely in my opinion, Philip may have remarried after John was born (she would only be ~ 19 when he was born). This assumes that Amy died some time after John’s birth. There is no burial records for Amy after records started in 1828 which suggest she died before this date. If this is correct then it raises a new possibility. Up to this point I have assumed, based on Amy being approximately 18 when she married, that Philip had no children born after c. 1800. If Emma was a second wife then it extends the window for Philip’s children; this might include Martha Newell who married Simon Curlew in 1830 since based on the date of her marriage she was likely born before 1814. 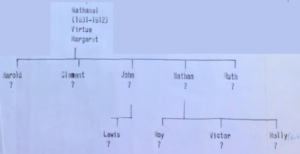 However, Martha is more likely to be a child of Philip’s son James who was a witness to the marriage or possibly even his younger son John (more on James and John and their children below) . Unfortunately, we have no burial records for either Philip or Amy; however, it likely that they were both buried in or near the old burial ground in the Dock which was located at the base of the hill east of the Newell land (see photo below). Since neither is recorded in Port de Grave burial records which start in 1828 we can assume, but not be sure, that they both died before that date. We can be relatively confident that Philip died prior to 1835 since a Voters List compiled that year only included his sons James and John. 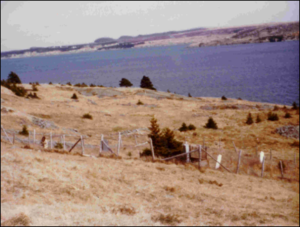 Photo of French Family Cemetery in Bareneed [Dock], Newfoundland (looking across Bay de Grave towards Cupids). http://www.frenchfamilyassoc.com/FFA/CHARTS/Chart057/Chart57gen6.htm. This burial ground was also used by the Batten and French families of the Dock (see: http://www.angelfire.com/fl/atacamasam/srupert.html) and possibly by the early Newells. As I stated earlier, Philip and Amy had two sons (James and John) that inherited land in ‘The Dock’. The following map from my 1971 report shows how Philip’s land was divided between James (to east) and John (to west). At this time there was no road through ‘The Dock’ just a trail along the edge of the cliffs and the houses were on the north side of the trail. The following photo shows this old trail c 1970s. The existing Dock/Otterbury) road was built around 1900 and extended along the northern end of the original grant; at that time the old houses were either abandoned or relocated. My 1971 research focused on Philip and his descendants. Philips son John (born c. 1793) was my gg-grandfather and because of this I had access to more family history and key documents, like his Will, so my research on this side of the family was more complete (more on this side later). My research on Philip’s son James was much less detailed but I did identify many of his children and some of their descendants. The following section presents my original research on James (with more background info on sources) and some subsequent findings but it is still a work in progress. I had much less information for Philips’ eldest son James (born c. 1785) but I was able to establish the names and a few dates for some of his children. Gen 5 great grandchildren of James born c. 1870s. The loss of pre-1859 Baptismal records for Bareneed also contributed to the confusion regarding this generation. These issues had less of an impact on reconstructing the tree for James’ brother John (my gg- grandfather) since I had other data sources. See my discussion on Abraham son of James for more discussion of this issue. As I indicated earlier Port-de-Grave Parish burial records indicate that James died in 1849 at which time he was 63 years old. Based on information from the baptism records of his children (see following) we know that James’ wife’s name was Margaret and that they were likely married sometime before 1816. In a working copy of my 1971 family tree there was a note where I wrote her name as Margaret Frathum. I can’t remember how or where I got that information. Frathum (or Fratham) is not a family name associated with Newfoundland, or for that matter England. There is one indirect association with Newfoundland and that is Unitas Fratrum [a name for the Moravian church]. There is also the town of Toller Fratrum in Dorset, it’s name translates as ‘Toller of the Brothers’, the brothers being the Knights Hospitallers. At this time I don’t think this name should be included in the Newell family tree unless someone finds other support. The following discussion outlines and updates my research on James’ children. The next documented reference we have for James is the baptism of his son Richard at St. Pauls’ Church, Harbour Grace in July 1816. This son Richard married Wilmot Daw (Dawe) in 1841 (see below, note James as witness). Richard and Wilmot had a daughter Mary Jane born in 1861 and this was the only child I could find for them. However, in later research, my cousin Ted identified several other children born prior to 1859 (start of Port de Grave baptism records); these were: Susanna b.1843; Margaret b. 1845; b. 1853 died age 17; Amy b. 1850 and Elizabeth Ann b. 1857. I have not confirmed these. Richard died in 1893 but I could not find a burial/death record for Wilmot. James and Margaret registered the baptism of another son Abraham at St. Paul’s in July 1820. We have a record of Abraham’s marriage to Ann Morgan in 1843. My cousin Ted indicated that Abraham died in 1878. There was a Abraham Newell, fisherman in Killigrews (bottom of Conception Bay) in 1871 (Lovells Directory) ; however, I now know that this is incorrect since his death was recorded at Bareneed [The Dock] on Dec. 2, 1900 at age 80 (est DOB 1820). Ted and I both missed this since the transcription we used incorrectly recorded his age as 50. Based on my original tree, Abraham had at least two children: Abraham who was the father of Vera and William (see below) and Robert. As I indicated earlier, it is likely that I missed a generation in the tree for James’ descendants so Abraham and Robert are likely grandchildren of Abraham. and the following James who died in 1916 (also born c 1846) is a good candidate for James. This James was born three years after Abraham (son of James) and Ann were married, making him a good candidate for their son. The following Abraham is listed in the 1921 census as born c 1878 is almost certainly the son of James and Fanny born in 1878. This Abraham was listed as the father of Vera and William. This Abraham was also in the 1911 Census (see below). Mary Wife 1879 Oct. 32 Port de Gr. I suspect that this Robert might be the Robert J Newell who was in McAlpine’s Dirctory for 1894 and 1898 and the Robert Newell who married Mary Grace Snow at the Bay Roberts Methodist Church in 1905. This Robert was living in Pictou, Nova Scotia in 1921 with his wife, daughter and various members of the Snow family. In 1925 this Robert John Newell moved to the US. In my original research I indicated that Abraham (son of James) inherited the eastern most part (1/4) of the land that James inherited from his father (Philip); this was likely based on information from my father John Robert Newell (b. 1908). 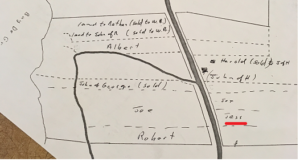 My old working notes also indicate that Abraham’s son Robert (grandson) got his land, the notes also indicate that Robert’s house was moved up (away from trail along coast) to the new road before 1909 and that it was torn down in the 1930s. Gen 5 Robert John and Abraham. born 1870s. 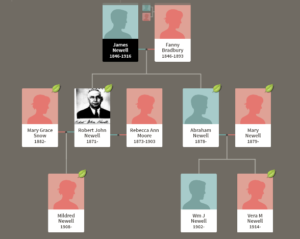 My ancestry.ca tree shows Robert John and Abraham and their children with Vera daughter of Abraham in lower right. Both Richard and Abraham (see above) were in my 1971 tree but there is one other documented son for James and Margaret that I missed. In January 1840, Isaac Noel, son of James and Margaret, was buried at Bareneed; based on his age (17) when he died we know he was born c 1822 which would make him a younger brother of Richard and Abraham. The remaining children I ascribed to James in my 1971 paper are based on indirect evidence. I had included Philip as a son of James in my original research; however, we have no direct evidence (e.g. birth record) for this so we must rely on indirect evidence . One of the few sources that document aspects of the lives of James son of Philip and his children are the Annual Reports of the Newfoundland Church Society . These reports started in 1840 but the earliest I could locate was for 1847. 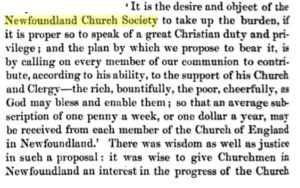 The Society was intended to allow Newfoundlanders to contribute to the support of the Church since before this time the Newfoundland Church was considered as a Mission. Note: The Scrape is a beach just west of ‘The Dock’ in what is now known as Otterbury and ‘The Ponds’ is an adjoining community just north of ‘The Dock’. At this time the Newell family was the major contributor to the Church Society from ‘The Dock”. We can assume that John Newell (15 shillings) was John son of Philip (my gg-grandfather) and James (8 shillings 6) was James son of Philip (the two largest contributions for the Newell family). I am assuming that the second John (5 shillings) must be John son of John (my g-grandfather) since he was the only John that we are aware of in this time period. This is a bit surprising considering this John would only be 19 at this time. 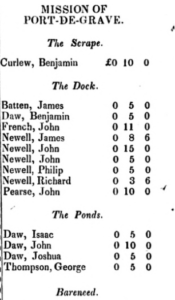 Richard could be Richard son of James (see above) born 1816 or Richard son of John born 1824 but I am guessing the son of John since the 1848 report only list one Newell in ‘The Dock’ referenced as ” Newell, R. (John)” who was likely Richard son of John. . However, the person we are most interested in is Philip (5 shillings). This is not Philip son of John, who was only a child at this time, so it was likely a son of James. Reports for subsequent years are sporadic (available for 49, 50, 53, 54 & 55) but there were no further references to Philip in any of these! One general comment is that John son of Philip and his sons appear to be either more dedicated to the C of E or better off financially. Perhaps the most telling evidence is a marriage record for Philip Newell of The Dock from 1844 which list James Newell as a witness. Based on the date of his marriage this Philip would have almost certainly have been born prior to 1826 so definitely not Philip son of John. The fact that Philip was a witness to a Methodist marriage in Clarkes Beach and married a girl from Clarles Beach suggest that his leanings might have been more Methodist than C of E. My original research list Philip’s children as John and George. I also had a note in my original working files that indicated that Philip’s land went to a Batten. There was a Philip Newell of Bareneed listed in McAlpine’s Maritime Provinces directory for 1870-1871; however, this might be Philip son of John who was born in 1844 (see later in this report). I originally thought that this Philip might be the Philip Newell who died 1882 (see below) since his estimated DOB (c 1824) would fit the marriage record and would explain why he is not in McAlpine’s 1894-97 Directory. Further research showed that this Philip was living on Signal Hill Road, St. John’s as was his daughter who died in 1887. This Philip was married to Hannah Newell and had a son John who were living at 48 Signal Hill Road, St. John’s in 1890. 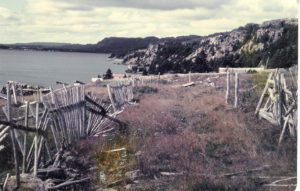 Further research indicated that the Philip Newell who married Hannah was living in Pouch Cove in 1870. Unless our Philip moved to Pouch Cove this rules out Philip of Signal Hill Road as a candidate for Philip son of James. The last reference to Philip son of James was the Church Society Report for 1847, after this he disappears from the records. James Newell who died in 1898 at age 82, which indicates he was born c, 1814 (2 years before Richard), is a good candidate for a son of James. I have ascribed this James to James son of Philip based on his birth date and other information (land inherited); plus, even if Philip had a second wife it is unlikely that he would name another son James. This is another case where reports of the Newfoundland Church Society can fill in some details. The James who contributed to the society in 1847 (see above) is likely James Sr. ; there was no data recorded for Port-de-Grave in 1848 and in 1849 (the year James Sr. died) the only Dock Newell recorded was likely Richard son of John (see earlier). However, starting in 1850 we have a James Newell contributing 3 shillings and 5 shillings in 1854. The last edition I could find with data for Bareneed was 1857 and this also had a James Newell. In my original tree, based on information from my father and/or Harold Newell, I had two children for James. these were Joe (my working notes had Jake) who married Susie and a Jane; it also shows Joe and Susie having two children Jake (Jacob) and William. In my original 1971 paper I indicated that James son of Jane inherited the center part of the land passed on to James son of Philip (between Philip to the west and Abraham to the east). My notes also indicate that Joe Newell’s house was relocated to the new road before 1909 and was torn down around 1920 when Joe moved to the US. The notes also indicate that as of 1971 grandchildren of James still owned the land. There was a Jacob Newell who married Mary Ann French in 1857. This Jacob would be the right age for a son of James. We have records for the following children born to Jacob and Mary Ann: Mary Ann b. 1861, Margaret Jane b. 1863 and Joseph French Newell born 1866. A Joseph Newell married Elizabeth Ann Bradbury in 1882 (early for someone born 1866). A Jacob Newell (Bare-Need) is listed in McAlpine’s Maritime Provinces Directory for 1870-1871. In McAlpine’s 1894 Directory there is a listing for Jacob Newell, fisherman at the Dock. A Jacob Newell died in 1912 at age 70 giving an estimated DOB of 1842 which would be young for someone married in 1857 but errors in age are common on burial records. There are several issues with reconciling the theory that this Jacob was a son of James with my original tree. The first is transposing the names of the father and son (Jacob and Joe) which is an error that I could see myself making (the tree for James children was a secondary project). The other issue is where is his wife Susie? One possibility is that I mistakenly assumed Susie in Jake and Susie was a wife but she might have been a sister. There was a Susannah Newell who married a William Richards in 1872. At this point I think that there is no evidence disproving the theory that Jacob was a son of James but also only circumstantial evidence supporting it. There are several other family trees that include this James on the Internet. One of the best documented was developed by Tina Newell (we corresponded in the past but I lost contact several years ago). Tina has a well documented tree with roots leading to James Edward Newell (born Bareneed, 1874, died Bell Island, 1937). This is the Edward Newell and family recorded in Bell Island census of 1921 who is listed as being born in Bareneed. In the late 19th and early 20th centuries many people from Conception Bay moved to Bell Island (located in the center of Conception Bay) to work at the Iron Mines. Tina indicates that this James Edward had earlier lived in Mackinsons (10 km inland from ‘The Dock’). The move to Mackinsons might be related to work on the Conception Bay branch of the Newfoundland railway or might be some how related to the Coveyduck family of Port-de-Grave that had moved there in the 1880s (see: http://www.explorenewfoundlandandlabrador.com/communities/makinsons.htm). Tina identifies James Edward as a son of Isaac Newell (b. 1844, d. Cape Breton N.S. in 1915) and grandson of James Newell Jr. (1814-1895). Another researcher, Paula Matchim , also traces her roots to this Isaac. She gives her ancestry as: mother Emily Brown, maiden name Newell, born May 26,1872 married to Samuel Brown. Emily’s father father was Issac Newell who married Sarah Morgan from Coley’s Point, Barneed area. Both of these theories fit with the recorded information available for Isaac Newell. We have a record of his marriage in 1868 to Sarah Morgan of Coley’s Point which was witnessed by James Newell. 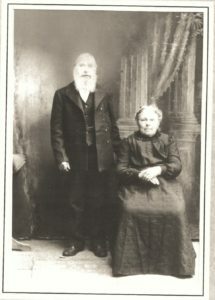 In addition, the recorded children for Isaac and Sara include an Emily and James Edward. Paula Matchim also identifies Isaac’s parents as James Newell, born about 1814, from Bareneed and Mary French, born about 1818, from North River. She also lists Isaac’s siblings as: Mary Jane Newell born Sept.1847; Mary Ann Newell born Feb.1850; Sussannah Newell born about 1851 and Margaret Jane Newell born Sept. 1854. Tina Newell indicates that Isaac was born in 1844. I don’t see any conflicts between these two trees and they seem well documented from Isaacs marriage in 1868. The only question I have is the connection back to James (son of James). I have no reason to doubt this step but, without clear documentation, I still classify this as a theory. This theory that Isaac was a son of James does not necessarily conflict with the Jacob theory that I presented earlier; it is possible that James had several sons. This Elizabeth was in my original tree and the only information I had on her, from either my father or Harold Newell (source slipped my memory), was that she was the ancestor of Jess Richard’s mother. When I was a boy, Jess and Bertha Richards lived on the north side of the Dock road opposite the center portion of the land owned by James son of Philip (see my original sketch map for the later Newells below, note different orientation with water to left). Apparently, Jesse’s birth was not recorded so he had the above copy made in 1949. This shows that Jesse was born in Sharestown (west of Bay Roberts) in 1882 and his parents were George Henry Richards (likely from Shearstown) and Elizabeth Ann Newell. There was an Elizabeth Ann Newell witness to a marriage at Bareneed on Jan 1 1881 (possibly before her marriage). George and Elizabeth were living in ‘The Dock’ at the time of the 1921 Census and from this we know she was born in 1857 (unfortunately no records available for that period). This Elizabeth is likely the person my sources were referencing but someone born in 1857 is not a daughter of James son of Philip (who died in 1849) so we are missing a generation. My cousin Ted identified Elizabeth Ann b. 1857 as a daughter of Richard son of James. If this is correct then this Elizabeth should be removed from the list of James’ children. This theory also fits with the pattern of land allocation. In my original research I had the land inherited by James son of Philip divided between three of his sons: Philip in the west, Abraham in the east and James with a double portion in the center. Jess Richards’ land abuts Abraham’s land so this was likely Richard’s land between James and Abraham. As I indicated in the section on Philip Newell there was a Martha Newell who married Simon Curlew in 1830. Based on the date of her marriage she was likely born before 1814. Based on her birth date this Martha is likely a daughter of James (who was a witness to her marriage). The other possibilities are that she was a daughter of Philip’s younger son John or even a child of Philip’s from a second marriage . John was my great-great-grandfather and we can estimate his DOB as 1793 based on his age (62) when he died in March 1855. John married Patience (likely Porter) before 1821 (in his Will of 1855 he states: My wife Patience to have the room upstairs and a servant girl to attend her. A Porter family history from Blowmy Down (Port de Grave) indicates that PATIENCE PORTER (daughter of Richard Porter) b. 1801, Blowmy Down; d. February 02, 1874 married John Newell of the Dock. My 1971 research indicated that John and Patience had six sons (John, Richard, Nathaniel, Henry, Philip and William Henry) and 3 daughters (Amy, Mary Ann and Grace). John’s Will of 1855 provides a snapshot of his male children (see my Early Research paper for a full copy of this Will). Daughters are largely ignored in this Will since they never inherited land and even wives of his sons were to be disinherited if their husband died and they remarried. The Richard Newell who was a witness to this marriage was likely her brother (see below). An Ancestry family tree for Henry Wells of Salmon Cove lists one of his daughters as Mary Ann Wells born 1827. ” 1st and first I give unto my son Richard Newell the west part of the room [the “room” indicates the land] and after his death to be his wife Mary Ann’s so long as she remain a widow with her children, But if there is no child and she should marry again she is to have no part of the property but to be equally divided between the remaining brothers. The reference to “if there is no child” in the Will suggest that Richard and Mary Ann had no children at the time the Will was written. There was a Mary Ann Newell who was buried 1867 at age 45 (est DOB 1822) who was likely his wife. On October 9, 1867, the ‘Tangiers’ a 131-ton brigantine owned by THOMAS BUTLER, the merchant of Port de Grave, was lost at GRADY. On the same day, the ‘Estelle’, a 176-ton brigantine, owned by RICHARD HENNEBURY was destroyed nearby at Indian Tickle. The Newell family rooms in Labrador were at Rovers Island in Indian Tickle and Richard Hennerbury was a neighbour in Bareneed and a partner with the Newells in Labrador so possibly Mary Ann was travelling in this boat. In memory / of / Selina Jane / Beloved / wife of / Richd. NEWELL / Died July 6th / 1906 / Aged 72 y’s / Nearer the bound / of life, / where all lay / burdens down / nearer leaving / the cross / nearer gaining / the crown. I could not find any reference to the birth of any children that Richard fathered by either wife. These were Richard son of James (see earlier discussion) and Richard son of John; however, McAlpine’s 1894-97 Directory for Bareneed only list Richard son of John since Richard son of James died in 1893. Unfortunately, Lovell’s Newfoundland Directory for 1871 missed ‘The Dock’. In 1884, 82 Bareneed men went to Labrador and a new Church of England school was built. Richard Hennebury and Richard Newell, two planters, and Samuel Moore, a merchant, all lived in Bareneed and owned schooners (source Decks Awash). I am assuming that this schooner owner was Richard son of John. The Newfoundland almanac, for 1887 lists Richard Newell as a Road Commissioner for Bareneed. Richard Newell of Bareneed registered a 1 acre grant of crown land in 1866 and a second 1 acre grant in 1867. I am guessing that this might be land to the west of the original Newell grant since this is where Richard son of John inherited land in 1855. 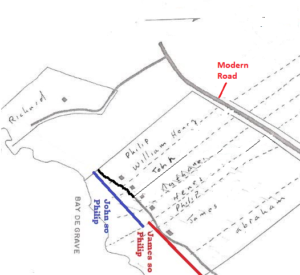 The land I identified as Richards in my 1971 paper (see map below) might include this new land which was in an area identified as belonging to Samuel Dawe in Philip’s original Grant (bounded SW by Samuel Dawe). Location of Richard’s Land c 1890s in relation to original grant (modified from my original 1971 sketch map). This Isaac is listed as Distressed versus Philip who was listed as Well Off. 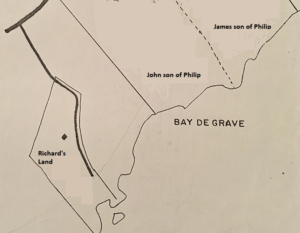 It is possible that Philip acquired some or all of the Daw(e) land after 1817 and incorporated it into his grant and this was land Richard acquired. John’s grave stone in St. Mark’s Anglican Cemetery, Bareneed gives his DOB: In memory / of / John NEWELL / Born / Jany. 5th, 1828 / Died / Jan. 16th, 1908 / Aged / 80 years. We know from Caroline’s death certificate that her father was Henry Wells (see: Caroline Newell wife John Death 1920 Mass ). Caroline was buried in Salem, MA where she was living with her daughter after John’s death. Based on an Ancestry tree for Henry it is possible that she was the sister of Richard’s first wife Mary Jane; however, this tree lists Henry’s wife as Mary Ann House but Caroline’s death certificate list her mother’s maiden name as Bushey (could possibly be Bussey, a name found in Salom Cove and sometimes confused with Bushey, see Family Names of Nfld.). John and Caroline had seven children: Patience b. 1861; Henry Walter b. 1865 (drowned 1892); Albert b. 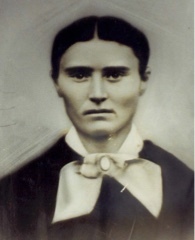 1868 (my grandfather); Mary Ann b.1872; Elizabeth b. 1874; Edith b. 1876 and Eliza b. 1880. More details on this family are provided in the section of this Web Site on “My Immediate Family’. We have a photo of John and Caroline taken c. 1900. My 1971 Sketch Map showing land ownership c 1860 (colored text added). Note: The trail along the front of the land originally connected to the trail through Richards land but this section has disappeared due to erosion of the cliffs. We know Nathanel’s date of death and estimated DOB from his grave stone in St. Mark’s St. Mark’s Anglican Cemetery, Bareneed: In / memory / of / Nathaniel / NEWELL / Died / Aug. 30, 1912 / Aged / 81 years / Thy will be done. In John Newell’s Will of 1855 Nathaniel received the next part [of land]to the east of John (see earlier Map). The following fills in some detail on this and fills some gaps. John NEWELL, beloved husband of Susannah Newell , killed at Smokey, Labrador, July 1, 1925, aged 63 years and Susannah Newell, wife of John Newell died Sept. 14, 1935, aged 69 years (Gravestone Bareneed). John married Susannah Serrick at Cupids on May 1890. Ruth married Robert James Wells at Bareneed in 1890 and later lived in Bay Roberts where her husband was a member of the Constabulary. There was a notice of her wedding in the Harbor Grace Standard that lists her father as Richard but this is likely a mistake based on Richard being a witness at the wedding. Nathaniel Jr (Nathan) married Priscilla (Lilly) Serrick in May 1894; Priscilla’s sister Susannah was married to Nathan’s brother John. A son of Nathaniel Jr. and Priscilla, Private Victor Perrin Newell, died on 17 Jul 1917 and is buried in Ayr Cemetery, Ayrshire, Scotland: The son of Nathan Newell, carpenter, and Priscilla Newell – to whom he had allotted a daily sixty cents from his pay – of the Dock, Bareneed, Conception Bay, he was older brother to both T.-Roy and to Mollie (see my section on WWI) . There is a old horse drawn hearse preserved in St. Mark’s Church, Bareneed (last used when I was a small boy) that was built by Nathan. Nathan also served on the Board of Education for Bareneed — Nathan Newell, Chairman, Source: Year Book and Almanac of Newfoundland. Nathan is buried at St. Mark’s Anglican Cemetery Bareneed (see http://ngb.chebucto.org/Cemetery/lily-roy-nathan-newell.shtml for a photo of Nathan’s grave stone). For the death of Clement above see my WWI section for Cpl. Clement Leslie Newell who died in 1818 and for more information on Harold see my section on Harold Newell. I found several 3rd cousins through Ancestry DNA that are descendants of Nathaniel. They have posted trees for sections of his family. I recently went over my early 1971 notes (from information supplied by my father) and these indicate that after his death Nathaniel’s land went to Harold and Clement who sold to William Henry; Nathan (Nathanel’s son) got Richard’s land and this was eventually sold to Mr. Pike. This was the piece west of the lane-way that ran west of Walter Batten’s land (shown on a previous map as belonging to Richard). The house that Pike bought was moved by Nathan to the present location (1971) before 1909. John son of Nathaniel got William Henry’s land (William Henry was John’s youngest son) and this was eventually sold to Walter Batten. Philip (son of John) sold his land to Nathan who also sold to Walter Batten. When I was a kid Walter Batten (BATTEN / Walter Nov. 5, 1913-Dec. 28, 1983 ) owned the land between my father’s land and Pike. I referenced Grace in my original 1971 tree but had very little information on her other than the record of her marriage at Bareneed in 1860 to Eli Mercer of Bay Roberts and several other references to her as a witness to other earlier marriages. There is no direct evidence that she was John’s daughter other than the fact that Richard and Nathaniel were witness to her marriage. Eli was born c. 1832 (estimated from his age when he died in 1908) and assuming she was in her 20s when she married we can speculate that she was born in the mid to late 1830s. In the name of the Father Son and Holy Ghost Amen I Eli Mercer of Bay Roberts, Planter, being sound in mind and memory do on this 11thday of June in the year of our Lord, one thousand nine hundred make this my last will and testament, as follows: I leave to my wife Grace Mercer all and everything I possess, to be hers for the period of her natural life, but with no power to part with, sell, or devise any portion of my land or other property, unless it be needful for her support, when she may with the consent and approbation of my Executors rent, lease, or sell such portion of the land or other property, as they may deem advisable or necessary for such purpose. One of their descendants has posted her Bio and photograph on their blog. and has allowed me to post her photo here. There was no Henry in the Dock in 1894 (McAlpine’s 1894-97 Directory) so this would also fit with Henry who died in 1891. However, this Henry would only have been approximately 7 years old when his father died and left him the eastern side of the grant! My reading of John’s Will indicates that the sons are listed in order of age which would make Henry older than Philip (born 1840) or William Henry (this is not the case for this Henry). Following the reference to Henry the Will states: Philip and William Henry to have the house and westermost part Jointly and in case of either death the youngest to take charge. Having the house where their mother was staying seems be more appropriate for younger sons. I am not saying that the Henry who died in 1891 is not John’s son but that there are issues that need to be investigated regarding his age; is it possible that he was born in 1838 not 1848 and the information was transcribed incorrectly. Based on the 1855 Will we know that John had a son Philip: Philip and William Henry to have the house and westermost part jointly and in case of either death the youngest to take charge. In my 1971 tree I show Philip born in 1840 and died in 1925 and his wife as Flos. However, based on the following 1871 marriage record it appears that his wife was Emma Bartlett (assuming it is same Philip). In 1872 Philip and Emma had a daughter Mary Bartlett Newell and two years later a son John Batten Newell, both born in ‘The Dock’. In 1876 Philip and Emma Newell had a daughter Florence Emma born in Seldom Come By, Fogo Island; followed by the birth of two other daughters in Seldom. At this time Philip was a school teacher and part time Lay Reader in the church at Seldom. He continued to live in Seldom and in the 1912 Census he is classed as business man. Philip died in 1925 and his place of birth is recorded as Port de Grave and his age as 81 [est DOB c. 1844]. Emma died shortly after the 1935 census was compiled. As I stated earlier Philip sold his land in the Dock to Nathan who later sold to Walter Batten. William Henry was the last son referenced in his fathers 1855 Will : Philip and William Henry to have the house and westermost part jointly and in case of either death the youngest to take charge. 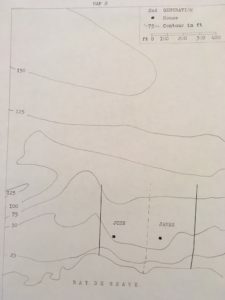 In 1971 I had no other information on William Henry and much of what I now know came from research conducted by Kate Newell with some help from me.